More science fiction • “The Passage” shows promise; “Roswell, New Mexico” adds undocumented immigrants to outer-space aliens. (Photo courtesy of Jan Thijs | CBS) Anson Mount as Captain Pike and Sonequa Martin-Green as Commander Burnham in "Star Trek: Discovery." 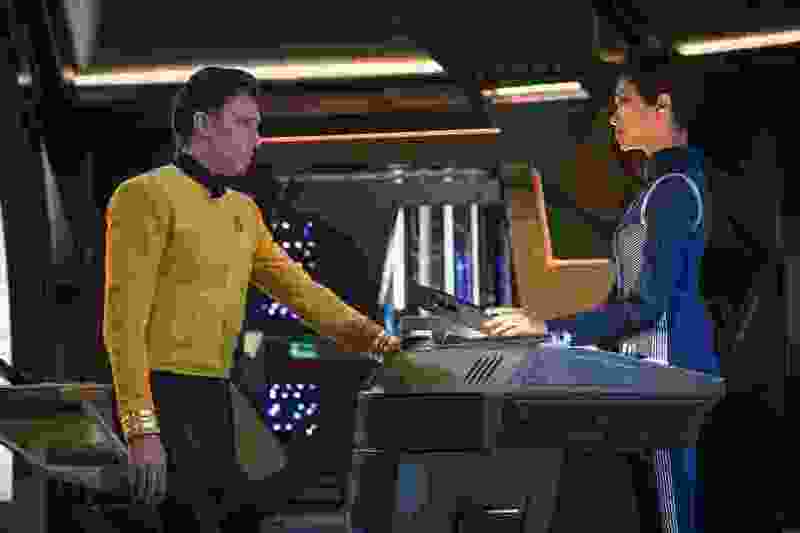 Season 2 of “Star Trek: Discovery” gets off to a strong start on Thursday, with Captain Christopher Pike (Anson Mount) taking command of the ship and a strong presence — albeit often unseen — from Spock. • Yes, “Discovery” is on CBS All Access, so you have to pay to watch. This has infuriated some Trekkies, but you also have to pay to stream Netflix and Amazon. And some of these people will be positively apoplectic when they realize that the upcoming “Star Wars” TV series will air on the upcoming streaming service Disney Plus — and you’ll have pay for that, too. By the way, Season 1 of “Discovery” is available on Blu-ray and DVD. • Yes, “Discovery” is different from previous “Star Trek” series. It’s heavily serialized. And that is not a bad thing. One of the reasons we didn’t have a “Trek” TV series for 12 years is that there was a certain sameness to the 624 episodes of the previous four series that aired from 1987 to 2005. The single most disappointing thing about Season 1 of “Discovery” (MINOR SPOILER ALERT) was the anticlimactic ending to the Federation-Klingon war. And that was singularly “Star Trek,” entirely consistent with the long-established template. You’re not required to like “Star Trek: Discovery,” but it’s not bad simply because it breaks the mold. • Yes, the main character in “Discovery” is a woman, Commander Michael Burnham (Sonequa Martin-Green). And, yes, much of the criticism the show has received is from “fans” who have trouble accepting that. Because they’re sexist. I’ve rewatched a bunch of “Voyager” episodes recently, and that series about a ship with a female captain (Kate Mulgrew as Kathryn Janeway) is better than I remembered. I’m convinced that much of the negative reaction to “Voyager” — including my own — was rooted in sexism. It’s 2019. Get over it. Back to Season 2 of “Discovery,” which picks up right where Season 1 left off. The Discovery receives a distress call from the U.S.S. Enterprise, and Captain Pike beams aboard. Pike takes command to investigate a phenomenon that disabled the Enterprise, and Mount is great in the role. The crew of the Discovery is better established (obviously) and the tone is somewhat lighter than in Season 1. And, yes, Spock plays into it. Although, in Episode 1, we see him mostly in flashbacks to his childhood — when he was less than thrilled to meet his new foster sister, Michael Burnham. Anything else would be a spoiler, although we do know that we’re going to see the adult Spock (Ethan Peck) a bit later on. By the way, you won’t be lost if you haven’t watched Season 1. Haters are gonna hate, and “Discovery” detractors will continue to heap abuse on the show. Ignore them. I’m not for a moment suggesting this is a great “Star Trek” series, but it is a good one. It might even turn out to be great. (Photo courtesy Eliza Morse/Fox) Saniyya Sidney and Mark-Paul Gosselaar star in "The Passage." Monday, 8 p.m., Fox/Ch. 13 • I like the idea behind this new series more than I like the series — which is a way of saying that the TV show isn’t as good as the book. It’s based on Justin Cronin’s book of the same title, and it’s about as dark as network TV gets. There’s a deadly flu virus in China that threatens the world, and scientists in Project Noah think they might have an answer — if they can find a way to control another virus that turns people into blood-sucking monsters. Vampires, although they don’t like using that name so the scientists call them Virals. The morally challenged scientists are experimenting on people with horrific results. As the series begins, they want to experiment on a 10-year-old girl, Amy Bellafonte (Saniyya Sidney), but one of the agents assigned to bring her in, Brad Wolgast (Mark-Paul Gosselaar), instead becomes her protector and the two go on the run. They continue to run for the first couple of episodes, then the show shifts gears in Episode 3. No spoilers here, except to say that — at least through three episodes — “The Passage” is quite faithful to the novel. It’s also maybe 20 percent of the way into Cronin’s book, which is the first of a trilogy. So there’s plenty of source material left to work with. And if the show gets canceled before it reaches a conclusion, we can always go read the books. Tuesday, 8 p.m., CW/Ch. 30 • Two decades ago, “Roswell” was a teen drama about a human girl who fell in love with an alien boy. On Tuesday, a “Roswell” reboot for the 21st century debuts, and it’s older and more political. It’s not just about aliens from outer space, it’s about undocumented immigrants and how they’re treated in the United States. It’s backlash to President Donald Trump and his supporters. Retitled “Roswell, New Mexico,” the story revolves not around high school students, but adults 10 years after graduation. 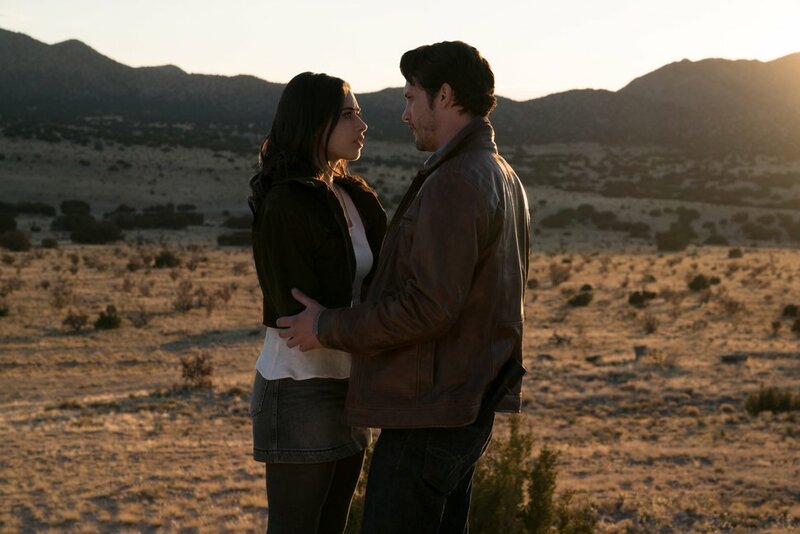 Liz Ortecho (Jeanine Mason), whose father is undocumented, returns to her hometown and learns that local police officer Max Evans (Nathan Dean Parsons) has been in love with her since they were kids. She also learns that Max is an outer-space alien — born 50 years after the famous UFO incident in town — when he uses his alien powers to save her life after she’s shot by immigrant-hating racists. From there, things get murky. The aliens — including Max’s sister, Isobel (Lily Cowles), and their friend Michael (Michael Vlamis) — are trying to hide their true identities. Including from Isobel’s human husband, Noah (Karan Oberoi). And Isobel and Michael are really ticked off at Max for letting Liz in on the secret. There’s a government conspiracy headed by Master Sgt. Jesse Manes (Trevor St. John), who wants to capture outer-space aliens for nefarious purposes. And Manes’ son, Alex (Tyler Blackburn) — who returned from combat duty without one of his legs — is in love with bad-boy alien Michael. And as if the whole alien thing didn’t create enough mystery, Liz is determined to discover how her sister died, and — you guessed it! — it didn’t happen the way everyone thinks it did. The three episodes screened for critics are intriguing, but slow-moving. There’s only so much brooding you can take before it becomes boring. If the producers pick up the pace, they might have something here. • Season 1 of “True Detective” was great; Season 2 was bad; Season 3 (Sunday, 9 p.m., HBO) — with Oscar winner Mahershala Ali (“Moonlight”) — gets off to a pretty great start. • Despite occasional gonzo moments, “Valley of the Boom” (Sunday, 8 p.m., National Geographic Channel) is a rather boring history of the 1990s tech wars — primarily Netscape vs. Microsoft. • If you’ve ever wondered what Hogwarts would have looked like if all the teachers and most of the students were evil, check out the dark, violent and ultimately depressing “Deadly Class” (Wednesday, 9 p.m., Syfy). If you’re not a fan of the 2014 graphic novel, you’re unlikely to be a fan of the TV series.